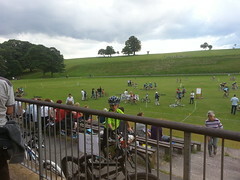 The West Riding Track League is a summer Track Cycling league which takes place on Monday evenings in Roundhay Park, Leeds, West Yorkshire. Registration now open for 2019! You need to register to take part in the races and even though it is a league, you can just race one event if you wish as we want to encourage eveyone to come and have a go. Click the JOIN OUR CLUB link to register. 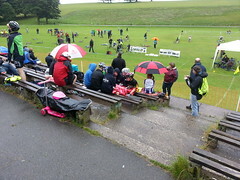 Racing takes place on a grass-surfaced oval and an evening’s racing will typically include several races each for a wide range of age categories, including under-12s. This year the minimum age to ride will be 5 years old due to large numbers registering. 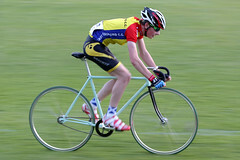 British Cycling points are available for the final standings for all categories for Under 14 and above this year including adults as we are registered as a Regional C+ event again this year. Under 12s can ride any bike in good working order, provided it has brakes. 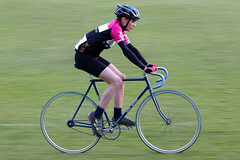 Over 12s and adults ride a more traditional “fixed wheel” Track bike with no brakes, and a “fixed” gear so the bike can’t freewheel – riders control the speed of the bike by applying pressure to the pedals. All riders need to have tyres with a grippy tread pattern, as slicks aren’t allowed to be used for grass track. 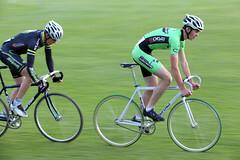 Light cyclo-cross tyres are perhaps the best. The league has access to a few bikes to lend to newcomers on a first come basis. Priority is given to youth riders but we usually can obtain bikes for adults. CANCELLED – 13TH AUGUST 2018 DUE TO ROTTEN RAIN! Presentation night now to be held in September and the 13th will be a counting event!